We paid supplements for pool view rooms which were quite expensive but worth it as we would otherwise have had rooms overlooking a busy main road. Rooms were adequate although the aircon was a little old but to be fair worked ok.
Staff were really friendly but very focused on the French and German guests, we were one of only 3 British families staying at the hotel. Breakfasts were good with plenty of choice from bacon and eggs to muesli and yoghurt. The evening food was Ok but very much the same and after the first week we ate out most nights. The location was excellent only 3 mins from the beach which was excellent and 20 mins into the town which was really worth a visit(especially the old town & harbour). The hotel was relatively quiet at night with minimal entertainment which suited us as there was plenty to be had outside the hotel. Overall little to complain about and I would recommend this hotel for families who want a relatively quiet hotel in quite a busy resort. We were disappointed on arrival at airport to be told hotel was overbooked and we were staying at hotel Minos. However on booking in to this hotel our rooms were fabulous, we had breakfast there and remaining meals were at the the Artamis. It was only 3 minutes walk between hotels. We had a choice 4 pools and could choose which suited us. The food was excellent and staff extremely pleasant and helpful. The entertainment was just right for us, with a very talented chap playing the electric violin. All in all it was a super holiday very pleased with Hellenic Voyages and would certainly travel with them again. We were in the main building and only complaint - not much of one was that we were on a main road. Did not bother us at night but could be a bit noisy during the day. We were on top floor so there was no traffic fumes. Room was clean and decent size with a double and proper single bed in the room. Cleaned daily to a high standard. There is a fridge in the built in wardrobes which because it is enclosed does give off some heat. But then it did help in drying things. Food was cold first night - not helped as the plates were cold. Complaint to the rep next day saw a big improvement. Plenty of choices and apart from the fact that some items were not always as hot as we would like we had no complaints. Others we spoke with agreed. Biggest complaint was it did not help the waistline. Being on AI meant we ate in the Chloe but the menu was the same in the other restaurant. Location is up a slight hill from the front. and a gentle stroll into the town with a good selection of places to eat and drink if you wanted a change. There was a bit of a problem with drinks during the day with having to cross to the annex pool bar which could be a nuisance. They are experimenting a bit this year - so we were told by staff - so it may change. During the hotter parts of the year it may be that it is a bonus. It is a refuge against the heat. The entertainment is a bit dire but the younf woman is working to improve things. On four nights Nikos plays electric piano and is quite good. On two nights Rema plays electric violin - everything from classics to jazz - he can make it sing and well worth visiting for that. Cannot single out any member of staff for special praise - simply because they were all first class. Have stayed at a few places that would benefit from them. It is not really a place for kids but there are plenty of attractions in the area for them. Trips out can be booked at the hotel from a selection of leaflets at no extra charge. We went gorge walking with Happy Walkers and the trips on the Yellow Train are particular value for money. We hope to go back again but not next year as we have other plans. To sum up - Highly Recommended. 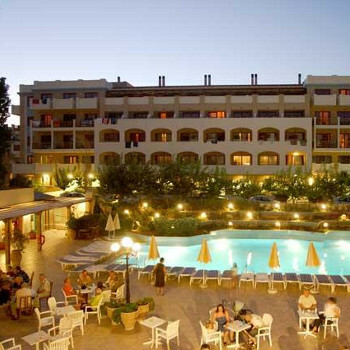 Theartemis Palace Hotel is a first class hotel for couples, nothing for children. The food is first class and served in spotless surroundings. The rooms in the old hotel are of a standard which rates it 4star, although rooms to the front can be a bit noisy due to traffic. The location is suitable for most people, no clubs pubs or bars on the doorstep, but a very short walk will bring you onto the promenade which takes you into the main town. On the way to which there are many tavernas and mini shops etc. It takes about 10 minutes to walk into the town, all on flat level footways, or the bus stops outside the hotel. The staff are spot on, nothings to much trouble for them. Would point out that a new section of hotel has been built on the old tennis courts, and it is to this section that your writer will be staying, they will also be eating in the Chloe restaurant if on all inclusive. This is a modern block with underpass access to the main hotel. It sounds like the prices Hellenic holidays are advertising, so expect what you pay for.